Road closures on Constitution Avenue, Madison Drive, and Jefferson Drive impact the National Mall route in multiple locations. 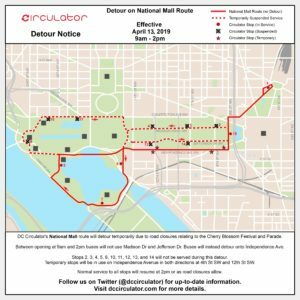 Therefore, the National Mall route will begin service on Saturday, April 13 in a Modified Tidal Basin Loop using Independence Avenue to connect Union Station with the Tidal Basin until 2pm. 5: 15th SW / Jefferson Dr.
12: 15th NW / Madison Dr. Temporary stops will be in use along Independence Avenue during this detour. These stops will be located at existing Metrobus stops in both directions of travel at 4th St SW and 12th St SW.
Once parade activities have finished at 2pm, or as road closures allow, normal service will resume to all stops.